Lib Dem leader Nick Clegg has said he is not the "king-maker" who will decide whether Labour or the Tories rule in the event of a hung Parliament. He told the BBC there would be no "backroom deals" ahead of the election even if it seems no single party was on course to win a Commons majority. Mr Clegg said politicians could not make such decisions "before people have their say" at the polls. Skirmishes between parties have begun with the election due by early June. Most commentators expect it to take place to be 6 May, with some pollsters suggesting neither Labour nor the Conservatives will win an overall parliamentary majority. If this happened it could give the Liberal Democrats a chance to take part in a coalition government. In recent days, both prime minister Gordon Brown and Conservative leader David Cameron have highlighted areas of agreement between their parties and the Lib Dems, on issues ranging from constitutional reform to civil liberties. But Mr Clegg said the differences were "more striking than any synthetic similarities". "An election is about people giving politicians their marching orders, their instructions. "What it shouldn't be about is politicians saying before people have had their say 'Oh, we are going to do, X, Y and Z regardless of how you vote'." 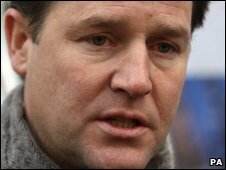 Mr Clegg said: "I want people to vote for us if they like what we say, if they agree with our principles." He said "It's the people in charge. I'm not the king-maker. David Cameron's not the king-maker. Gordon Brown's not the king-maker. It's the people who are the king-makers." Mr Clegg said: "If the British people don't give any party an absolute majority, an outright majority, then the party with the clearest mandate has the first right to seek to govern." But he did not suggest whether this mandate applied to the party winning the most Commons seats or the most votes from the public. Mr Clegg said that, whatever the outcome of the election, the Lib Dems would seek to deliver their "core priorities" of taxation reform, a "fair start" in life for children, creating a greener economy and "reinventing" politics. On Monday, Labour and the Tories engaged in a war of words about each others' tax and spending plans. Ministers said there was a £34bn hole in the Tories' budget calculations while claiming their opponents were in "disarray" over whether to introduce tax breaks for married couples as suggested in the past. Forced onto the defensive after appearing to downgrade the earlier policy pledge, Mr Cameron said he would "definitely" seek to recognise marriage in the tax system and accused Labour of dishonesty over refusing to admit future spending cuts.